Vintage Lake Lodge, f/k/a Lichte Cottage, is under new ownership and is undergoing a complete renovation. Come and enjoy this remodeled lake-front cottage located just minutes from dining, shopping and all the Dells attractions. Vintage Lake Lodge features a retro kitchen, living area with a vaulted ceiling, sun room facing Lake Delton, 2 bedrooms, 1 bath, and WIFI. There is an outdoor deck with grill plus an outdoor fire pit. All this right along the beautiful shores of Lake Delton! Book now to receive 15% off any 2019 reservation. This special is ONLY good until photos are put on the website of the remodeling project. Cottage will open for rentals on or around May 15, 2019. Please call Sand County Service Company at 1-800-822-7768 to reserve your stay at Vintage Lake Cottage. WRAP IT UP I'LL TAKE IT Enjoy time on beautiful Lake Delton, either ice fishing or swimming. Only minutes away from all the Wisconsin Dells has to offer, from dining to water parks and attractions. We have 4 homes and 3 condos available. Perfect for a family get away, with enough room for all. Please call us at 800-822-7768 to make reservations and receive a 25% discount on your stay. Offer good for new reservations, no other discounts apply. STAY 2, GET FREE CHULA VISTA WATER PARK PASSES!! Stay a minimum of 2 nights in any of our condominiums, select cottages or homes and receive 4 FREE passes to Chula Vista Waterpark! Sorry, but the passes are NOT valid over Easter weekend. Not valid with any other offers or discounts and for New Reservations Only. Must call 800-822-7768 to reserve and mention this Special. Reservation must occur prior to 4/30/19. Some cottages and homes are restricted from this Special. Please Click Here to see what is available! Reserve 3 nights at any of our condos, cottages or homes and get the 4th & 5th consecutive nights FREE during the dates of 3/1-4/30!! Advance Deposit MUST be paid at the time of booking to receive this Special. Book NOW to take advantage of these savings. All Specials are for new reservations ONLY and NO OTHER DISCOUNTS will apply. Some select properties may be excluded from this Special. Call 800-822-7768 to reserve. KOBY'S KABIN - Rent this home for 3 nights between the dates of 1/19 - 4/30/19 for $400 per night or for 4 nights during those same dates at just $325 per night!! 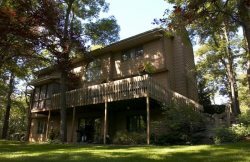 This home is 50 Minutes North of Downtown Wisconsin Dells and overlooks beautiful Lake Petenwell. Your family will enjoy this remodeled 6 bedroom/5 bath modern log home nestled on a beautiful wooded lot. This lodge sleeps 20 and offers a great getaway with family or friends for the holidays. Relax by the gas fireplace in the 2- story great room and enjoy the winter scenery. There is WIFI and Apple TV to 4th generation. People can now stream videos etc from their IOS devices .. And don`t forget Wisconsin Dells is a quick 50 minutes away. Reservations must be made by phone at 800-822-7768 and must be paid in full at the time of booking. Please mention this Special when reserving.